Quirky, kooky, polka & swing inspired jazz, entertaining, sometimes a little dark. Can jazz be campy? Can jazz be entertaining? Ah, the age old question, what IS jazz anyway? 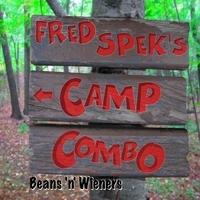 Seizing on the general public’s fear of "jazz", Fred Spek changed the name of his zany group from The Jazz Campers to CaMp CoMbO and quickly found that it was easier to get bookings at certain clubs, more folks came out to shows and nobody really minded if there was jazz on the menu. Shunning long tedious solos, CaMp CoMbO join a list of North American bands who’ve attempted to inject some arty fun into the jazzy side of popular music, including 1940-50s nutbar Spike Jones, Esquivel’s crazy arrangements, Toronto’s own Shuffle Demons and Atomic 7, Vancouver’s The Molestics, and USA’s Squirrel Nut Zippers. Is CaMp CoMbo "jazzy"? You decide! It is a mix of swing-jazz and polka, although CaMp CoMbO also sneak TV themes, surf beats, assorted swingers and maudlin ballads on to set lists.